Previously we saw how Jesus came into life by becoming implanted into the womb, special way, in the human being Miryam/Mary. “18 Now the birth of Jesus Christ took place under these circumstances: When His mother Mary had been promised in marriage to Joseph, before they came together, she was found to be pregnant [through the power] of the Holy Spirit. 21 She will bear a Son, and you shall call His name Jesus [the Greek form of the Hebrew Joshua, which means Savior], for He will save His people from their sins [that is, prevent them from [a: Marvin Vincent, Word Studies in the New Testament.] failing and missing the true end and scope of life, which is God]. The Messiah, our only man mediator and Saviour, is to be defined first by Matthew and Luke and then by Paul in 1 Timothy 2:5, and then only later by John, and not in a way which pits New Testament book against book and results in confusion and disunity, excommunication, even murder! Jesus did not come out of a sort of a simulated death. He was taken out of death by his Father. It was the God of our fathers who rose up Jesus, whom was murdered by hanging upon a piece of wood . Jesus is thus also God’s “preeminent Son,” “firstborn and brought into the world” by special procreation. Albrecht notes, referring to the copious research of Theodore Zahn: “I am following here in John 1:13 an extremely old reading found in Irenaeus and Tertullian. The singular verb ‘was begotten’ [aorist again of gennao] referring to Jesus, not believers, prevailed in texts from the second to the fourth century in the West, and left important traces in the East also. John confesses expressly here his belief in the virginal begetting and birth of Jesus, which Matthew and Luke describe in much more detail” (Albrecht, note on his translation of John 1:13, Anthony Buzzard’s translation of the German). The Jerusalem Bible adopts this reading also. Tertullian actually accuses the Gnostics of trying to rid Scripture of this evidence of the virginal begetting — by diverting the reference from Jesus to Christian rebirth! This meant changing the verb from an original singular to a plural. Luke presents Jesus as Son of God related to God in a parallel fashion to Adam (Luke 3:38) and shows us on other occasions that his and our Father considered Jesus as His son. 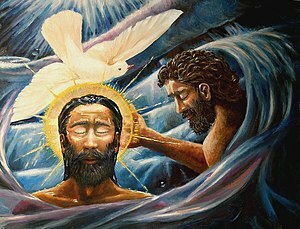 At the baptism of his nephew John the Baptist heard the voice, like all the people around that place at the Jordan, and saw a bodily form (sōmatikōi eidei) or the dove giving sound of the voice of the Divine Spirit (pneuma theou). Those writings from the apostles should made it clear that we got a child in a family who was given a special place in the heart of the Creator, because it was a righteous child willing to take up the command of its Father and therefore receiving the esteem, honour and glory, more than anybody else. So it was Gods voice from the grandeur of the sh’khinah, the magnificent glory, which let us know that Jesus, resplendent with light from God the Father, was His beloved son. The attentive reader of Scripture will hear echoes of Israel as Son of God (Exodus 4:22; Hosea 11:1) and Davidic kings (Psalm. 2). Like Israel before him, Jesus, the Son of God, goes through water to begin his spiritual journey (Luke 3:21; cp. Exodus 14, 15). In the wilderness and under trial Jesus proves himself to be the obedient Son unlike Israel who failed in the wilderness (Exodus 14-17; 32-34; Numeri 11). From the nativity story to the story of the beginning of Jesus ‘public life we see the line of the human link and often we also shall get to see the fragility of the Master Teacher, who sometimes got tired of the human crowd around him. 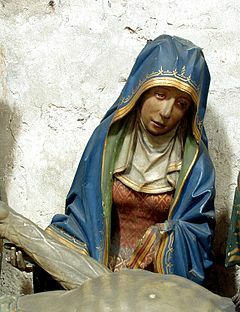 Virgin Mary at dead body of her son Jesus - Grablegungsgruppe in Groß St. Martin, Köln. The whole story is ruined if another dimension is added to the story, namely that the Son of God was already a pre-existing member of an eternal Trinity. Gabriel has carefully defined the nature of Jesus’ Sonship and his words exclude any origin other than a supernatural origin in Mary. Gabriel’s Jesus, Son of God — the biblical Son — originates in Mary. He is conceived and begotten by miracle. In pre-existence Christology, the main plank of Trinitarianism, a conception/begetting in Mary’s womb does not bring about the existence of God’s Son. According to Gabriel it does. Neither Gabriel nor Luke could possibly have been Trinitarians. Jesus was born of his mother, and grew up to reverence God, his Father. We learn that he “increased in wisdom and stature and in favour with God and man” (Luke 2:52). This expresses normal development; but if Jesus were God such a statement is incomprehensible; or if he pre-existed, it meant that he must have forgotten everything he knew in his previous existence, and had to learn it all again! The testimonies which teach the indivisible unity of the Deity, as the One Father, out of whom ALL things have proceeded, and who is supreme above all, even above Christ (I Cor. 11:3), are inconsistent with the Trinitarian representation of God. The supremacy and unity of the Father would not be affirmable if there were three co-equal personalities in His One personality—a doctrine which presents us with a contradiction in terms as well as in sense. It’s almost like a curse for women to not be able to have children so why would Mary of all women have to go through life without any children (apart from Jesus who died) or grandchildren? That would indicate that she certainly was not BLESSED at all. Nowhere does the Word of God say that Mary had no other children. Normally young women are able to bare children so to assume that Mary was out of luck is to start with an answer and trying to find support for this answer in the Bible.